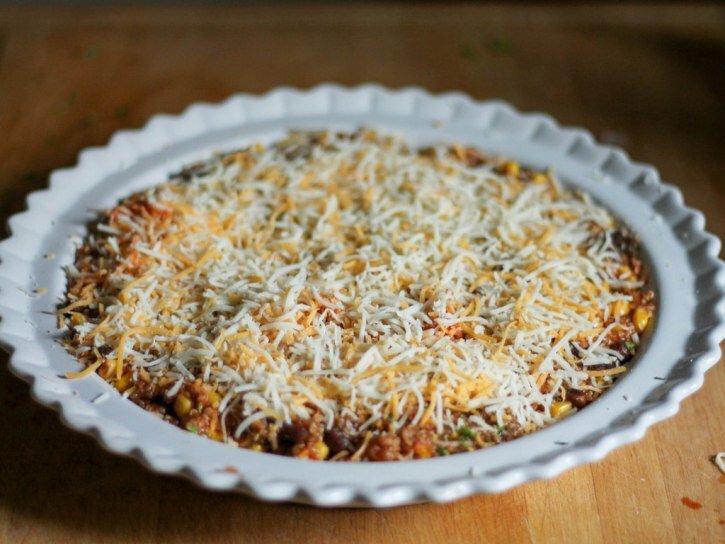 Quinoa enchilada bake is a delicious appetizer or dinner! Best of all it’s made with an easy homemade enchilada sauce! How was your weekend? Did you do any holiday baking? I flew back into Chicago on Saturday night then enjoyed a relaxing evening with Tony. We tried to find something to watch on Netflix since we recently finished Breaking Bad, but nothing seemed convincing enough. That and we can’t seem to make a decision ever. What are some of your favorite TV series on Netflix? I thought The Fringe looked really good, mostly because Pacey is in it. In other news, my birthday is next week (on the 22nd!) and I’ll be turning 26. I don’t know what I want for my birthday treat, usually it’s pumpkin pie but this year I’m kind of feeling a BIG fat doughnut or chocolate mousse. Is it sad that dessert is the most important thing to me on my birthday? Enough about birthday dessert. Let’s talk entertaining and the holidays! I know most of you are doing holiday parties this next week so I wanted to make something savory that was a little different. That’s right, you can walk up and surprise everyone with your homemade dish. And bonus! It’s healthy too. This sauce is simple and you can use a canned enchilada sauce or easily make your own (listed in the recipe!). I really like making my own enchilada sauce; there’s so much more flavor going on and it’s simple to do. Plus, then you get rid of ingredients you don’t need such as corn starch and things nobody can pronounce. It’s all about how much time you have though, I understand that. If you decide to go the canned enchilada route, there are a few great brands of enchilada sauce at Whole Foods. Now check out what happens in this recipe. The base of the enchilada sauce is canned tomato sauce, garlic, spices and herbs. You’ll simmer it then add fire-roasted tomatoes (I used Muir Glen!). 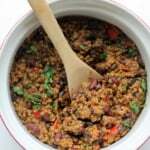 After that you’ll mix black beans, corn, quinoa and your homemade sauce together and pour into a casserole dish. Add lots of cheese on top and bakeeeeee. Tell me that doesn’t sound easy. I like this dish for entertaining or just for serving for dinner. If you’re serving it for entertaining purposes, I recommend pairing it with some tortilla chips. Like the crunchy, salty ones. YUM. DIP IT. 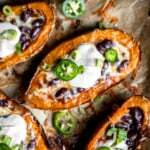 If you do end up serving this as a main dish, it’s great in warmed corn tortillas and topped with sour cream or greek yogurt. I also love adding extra cilantro on top and guac. I hope you guys enjoy this recipe. My mom is basically in love with it, therefore I know it’s good. If you make anything from AK, be sure to tag #ambitiouskitchen on Instagram so I can see what you’re cooking up! To keep up to date with posts and behind the scenes info on Ambitious Kitchen, follow me on BlogLovin’, Feedly, Facebook, Twitter, Instagram and Pinterest. xo! 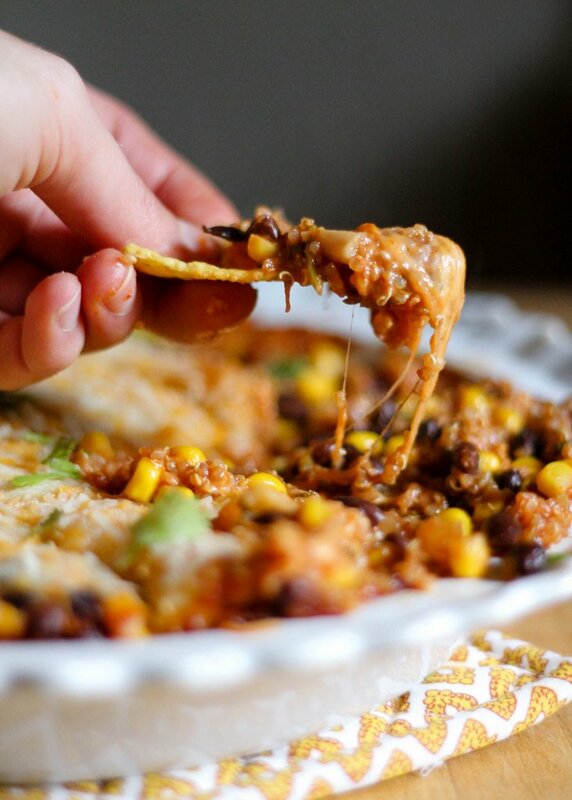 This black bean, corn and quinoa enchilada bake is a delicious appetizer or dinner! Best of all it's made with a homemade enchilada sauce! 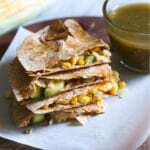 Serve with tortilla chips or corn tortillas. Place 1 cup of water and 1/2 cup quinoa in a small saucepan and place over high heat. Bring to a boil, then reduce heat to low, cover and simmer for 15 minutes. Remove from heat and fluff quinoa with fork. In a medium saucepan or skillet, heat olive oil over medium high heat. Add in onions and cook, stirring frequently until they become translucent, about 5 mins. Add in garlic, chili powder, cumin, salt and oregano and cook for 30 more seconds. Add in tomato sauce and water; stir well to combine. Reduce heat to medium-low and simmer sauce for 10 minutes. 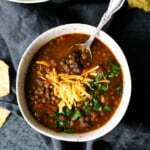 While sauce is simmering, add drained fire-roasted tomatoes, black beans, corn, cooked quinoa and cilantro to a large bowl. Next, add in your homemade enchilada sauce and 1/2 cup of shredded cheese. Pour into a 2-quart oven-safe casserole dish. Sprinkle remaining cheese over the top. 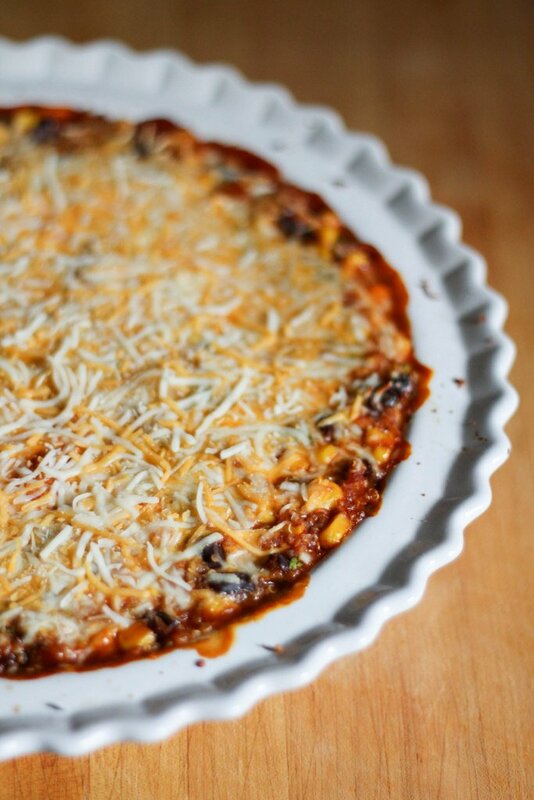 Bake for 15-20 minutes or until cheese on top is completely melted and the filling is bubbling. Recipe makes 6 servings as a dish. If this is for entertaining, the recipe will serve 10-12. 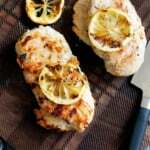 The nutrition for this recipe is based on 6 servings for a meal. 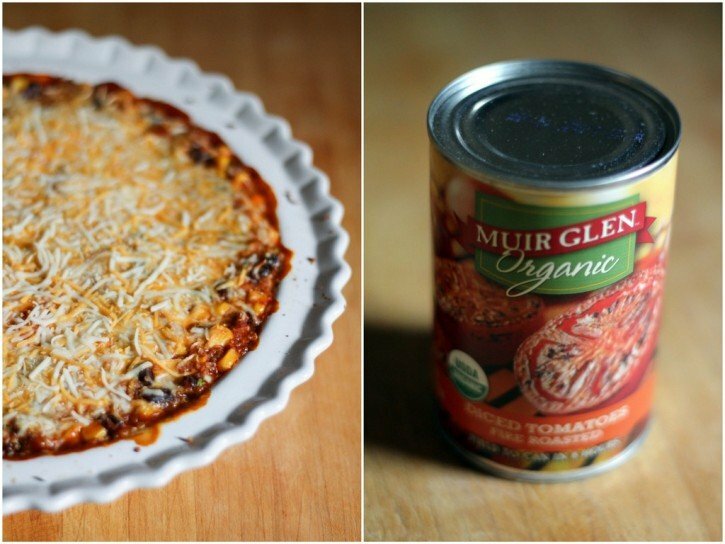 Disclaimer: This post is part of a partnership I have with Muir Glen. I love their organic products and highly recommend them. Thanks for continuing to support Ambitious Kitchen! 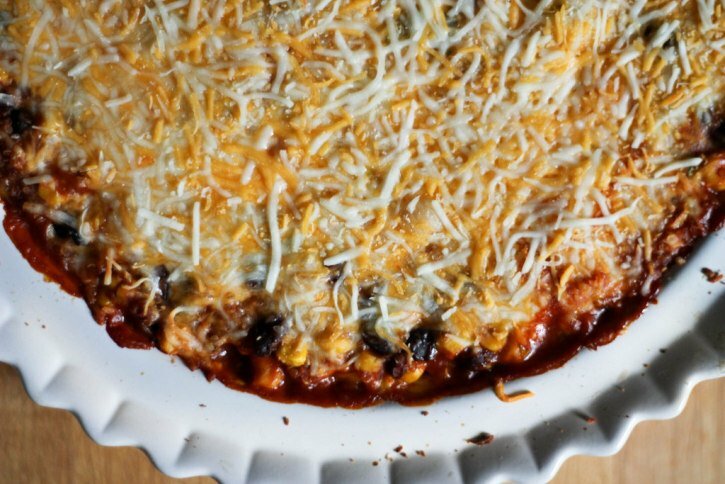 30 Responses to "Black Bean, Corn and Quinoa Enchilada Bake (or dip!)" Mmm! That looks delicious – as either a meal or a dip! And I LOVE Muir Glen. This looks fantastic, I love the idea of putting quinoa into dip! Also, Peaky Blinders and Blacklist are two great shows on Netflix– they hook you right off the bat! This sounds amazing. Love the simplicity and all the cheese 🙂 what a fun dish to share with friends. Happy early birthday! This dip looks crazy good!! 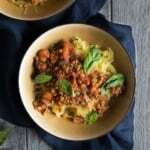 Totally in love with the quinoa in there! The perfect dish to bring to a party you’re saying? Well, our office Christmas get-together is later this week but people over here are usually skeptical towards anything they don’t know – enchiladas are almost unknown over here and I bet none of my colleagues has heard of quinoa before. I’ll keep this in mind for batch-cooking for myself, though. Mmmh. I have a quick question, can you switch up the chili powder? I make homemade enchilada sauce by using either Ancho chili (my son, daughter and I love) or Chipotle chili (hubby’s fav). 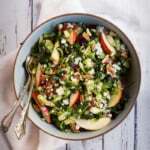 I wl definitely make this as a New Years Eve appetizer! I fear nothing will ever fill the void the end of Breaking Bad left in our hearts. 😉 And now Sons of Anarchy is done, too, wahhhh! Anyway, totally trying this recipe tomorrow and can’t wait to see how it turns out, thanks! I made this minus the beans because I didn’t have any. Served as a dip and then used the leftovers as a “salsa” with chicken thighs in the crockpot. Added a little chicken broth to thin it out and then served it in burritos and nachos. Yummy! Hi Monique, if I use bottled enchilada sauce, how much do I use? I forgot a couple of the needed ingredients to make my own. Thanks!!!! We have enjoyed “the intouchables”, white collar, prison break, chuck, and being Erica (my girl show). This dish was so delicious! Going to be a standard in my house. Cut up avacado and added as a garnish. Thanks for always great food! Hi Monique. Came across this recipe a couple of weeks ago and finally have an occasion to make it :). I was wondering if you could add ground beef or chicken? Oh man, this looks and sounds awesome! Can I make this in a slow cooker? It would be easier for out party and would stay warm. A slow cooker should work! Tonight for dinner I made this super tasty dish!! My fam loved it! The only slight variations I done was: cooked quinoa in low sodium organic chicken broth, & to the sauce I added half a teaspoon of the Trader Joe’s taco seasoning. It was loved by all 🙂 thanks soo much! I made this for a team meeting at work and it was well received. We had this as a dip with corn chips. I substituted daiya deliciously dairy free cheddar cheese ( because of dairy allergies) and used 2 teaspoons of Berbere, a Chile and spice blend used to season many Ethiopian dishes in place of the cumin and chili. Delicious! So happy to hear that! And those spices sound delicious.